In just the first couple of weeks of 2019 there's been a couple of miniature golf items I saw fit to throw my opinion together for, so here you go dear reader. The first is the really fun news. The USPMGA recently announced Team USA for the 2019 World Adventure Golf Masters (WAGM) to be played in Sweden. There are three teams of 4 playing (Red, White and Blue of course) and while I didn't make one of the core teams I was named the alternate player for the team this year. 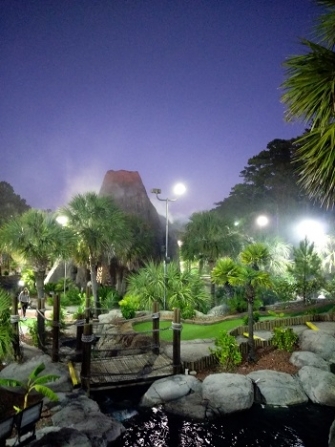 I have to say it�s one of the coolest things I've experienced in my miniature golf life. I don�t think that growing up I ever had a real expectation of representing my country in a sporting event and even when I found out about international miniature golf tournaments, I figured it was an outside chance at best or something that was way down the road with all of the great players in the US. I�m obviously hoping that I can snag an individual spot (if any are available) to actually play in the tournament (and I would never wish that someone wouldn�t be able to make the team) but even if I don�t, just being named to the team is a great accomplishment. I've very happy to represent both the (somewhat) younger players in the sport as well as New England. I really look forward to working with the team and supporting them throughout the whole process. U-S-A! U-S-A! U-S-A! The next item in the minigolf world is that the USPMGA recently made a Facebook post on the outline of the plan for this year�s Master�s and�well�the comment section got interesting (cue Michael Jackson eating popcorn meme). In short, the tournament will consist of 12 rounds now spread over 3 courses in Myrtle Beach with an interesting daily format that brings everyone together at one course twice during the tournament. I was going to leave my own reply but then realized I had way more thoughts than were appropriate for a comment, so decided to take to the blog. Please remember to view the disclaimer at the bottom of the blog because I�m definitely in opinion territory. Let�s start with I will be playing the tournament either way this year (assuming nothing personal comes up to prevent it). There�s very few format changes that would cause me to miss a chance at playing any minigolf tournament, especially a major tournament. I play a local tournament that is frustratingly 3 rounds over 2 days � so I can manage a few changes. Plus, I now use the trip as a vacation for the family (and I try to play a bunch of other courses for the website) so I will be there regardless and honestly I�m going to support pretty much anything miniature golf. In the comments there has been some discussion about focusing more on MSOP versus dealing with trying to master (pun intended) 3 courses, some of which have also recent changes to their construction from bricks to rocks adding a bit more randomness to the shots. I can certainly understand making priority decisions and the MSOP has more money on the line, with a bit more theatrical fanfare, that makes a trip like that worth it. However, for me, that�s a putting tournament and not a miniature golf tournament. One of the things I like about the �American� style tournaments is that they are played on courses that aren�t the more international competitive style and have the same level of randomness you�d get from playing minigolf on an everyday basis. I think it makes the tournaments slightly more accessible to people here versus jumping into a completely different format or style. I also think that it�s somewhat an added level of skill to master an obstacle like rocks. It�s one of the reason I say I could beat someone like Phil Mickelson on a miniature golf course heads up � he�s a way better putter than I�ll ever be, but I�m better a �miniature golfer�. Anyway, I don�t begrudge anyone choosing MSOP over the Master�s, it�s just not a personal thing I would do. That being said � I do have two cents when it comes to the format change. I agree with others who have said it could negatively impact getting others into the tournament. I�m having a hard enough time getting people to join the Open because of time to practice and that�s just one course. I barely can commit enough time to practicing 2 courses in October and I know I have one of the more lenient vacation schedules out there. In addition, I think the added mental challenge of the schedule (versus a more simple 5-5-2) is a level that doesn�t need to be piled on top of an already mentally taxing tournament. I also understand wanting to make changes to fine tune the tournament (heck, professional leagues are constantly changing rules � look at the flag rules in the PGA now), but I feel like we�re not in a situation where that is needed right now. For one, we don�t have a ton of USPMGA tournaments where we�re playing at the same courses year over year and causing boredom with consistency. Second, the Master�s has had very little consistency over the years, both because of course changes and sometimes weather impacts (like we lost a whole day this year), so it�s hard to tell if anything already in place is �working� before we go making changes. One of the things about the �big� Masters that is alluring is that it is played on the same course every year. It will be interesting to see the overall impact of the changes. I�m hoping it doesn�t change the attendance figures much (I like seeing all the big names there and the bigger the tournament the better for the sport) but it will be interesting to see what happens to the standings if we do lose some of the top players. I�m also interested in seeing if it impacts the scores. I could see it going either way � with the top players not running away with it because it cuts down on time to hone any one particular course or it allows the top players to pull away even further because they can rely on innate skill over practice. I know I�ll be spending a bit more time on the 3rd course this year since it�s been forever and a day since I�ve played that one. Seems like it may be something interesting for the minigolf stat-heads out there. In the end though, I�m thankful Bob is always thinking about how to improve the tournament, even if I might not agree with some changes. But before we even get to October my more immediate tournament concern is the new U.S. Open course we�re playing this year and figuring out how to tame that bad boy! I think that is definitely a possibility, and have seen it echoed by a few others. While I hope it doesn't happen, if we do see a hit to attendance this year, I hope there's some reflection and discussion with players who didn't attend as to why. If you are saying that adding a course for the USPMGA Masters will hurt attendance and discourage new players, you are correct. There are still top PPA players who have not participated in the Masters. Adding a course will help keep them away.